If a search engine has found you seeking the nuts and bolts of how to control lawn moss with iron sulphate you need to go here for the real deal. My previous post has now been read 78,000 times and has a life of its own. My effort today is more chatty and takes up a few points raised in the huge compendium of comments and questions on my original post. There has been something about iron sulphate in my history. For fifteen years I wrote a gardening article for Bolton Percy Parish magazine. It seemed to me that hardly anyone read it. There was never a single question. At best a dozen villagers must have dipped into it - and probably a dog or two chewed it over. And yet 25 years later I gave a lecture back in the village and someone commented how he still remembered my ‘witches brew’ of a near saturated solution of iron sulphate dispensed in a watering can from my dustbin and how he was still successfully using iron sulphate to maintain quality in his lawn. Iron sulphate does so such more than merely control moss! When I started blogging Cathi suggested she might photocopy my 200 faithfully preserved magazine articles. It was easier to write new ones and Brenda threw the old ones straight in the bin! When I retired from teaching one of my numerous activities was to lecture to garden centre staff at Homebase. In those days the so called ‘sheds’ took the view that their staff should know something about gardening and knowledgeable gardeners gravitated to work in their gardening departments. I remember one worker in Newcastle was a retired agronomist. 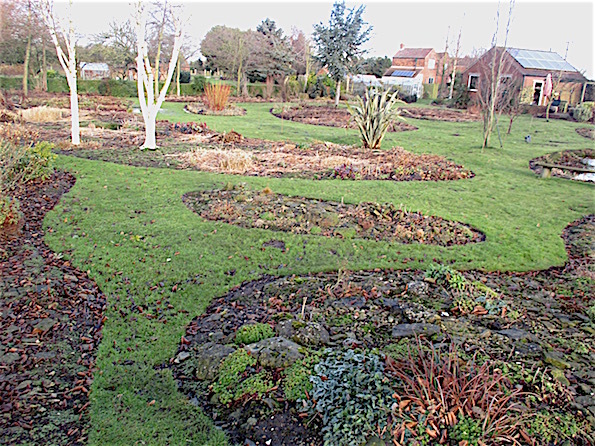 He informed me that my own garden in York was on an alluvial sand deposit of the River Derwent. He also mentioned that my old college was built on a glacial terminal moraine. A former water board employee in Wakefield told me about all the nitrate in my tap water and how it would encourage waterweed in ponds. Those were the days and most of the sheds now demand of their staff complete product versatility and some even prefer those horticulturally ignorant who won’t talk too much and don’t know that the tree paint they sell is utterly useless and harmful. …. 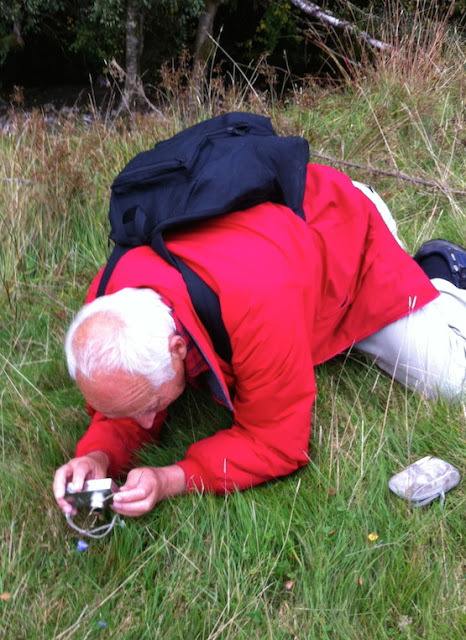 "Chemical control of moss is a very confused grey area arising from the Pesticide Regulations. A curious and utterly stupid anomaly in the regulations is the status of iron sulphate. An anomaly that suits garden centres only too well. 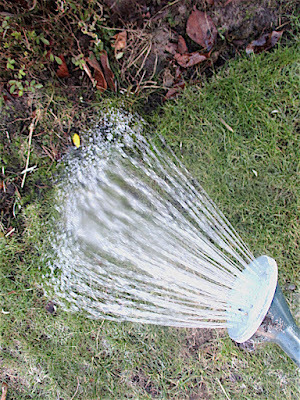 Iron sulphate is the very best way of a speedy kill of moss but it is not registered by any manufacturer as a pesticide. Licensing costs too much and firms choose to register their own products whose active ingredients are various formulations of iron. 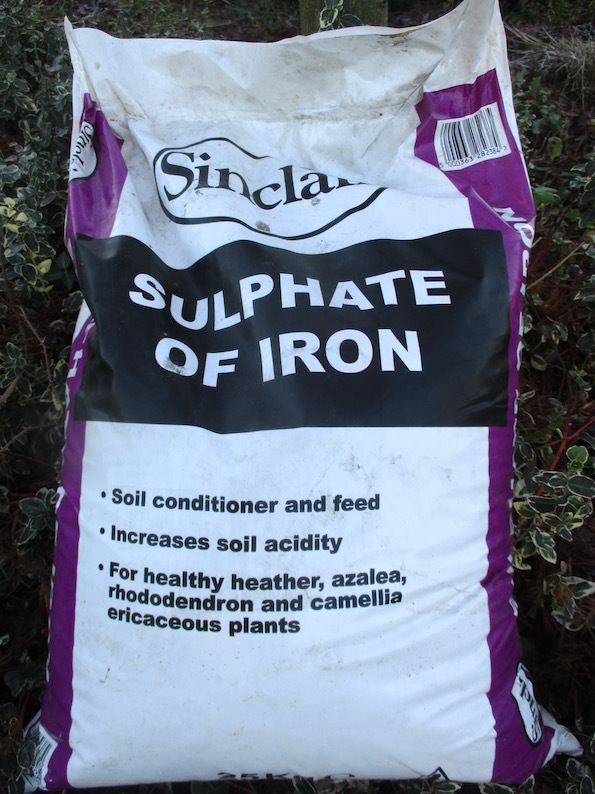 Iron sulphate is also wonderful fertiliser. There are no inhibitions to using it for this purpose. It logically follows that you can fertilise your lawn legally to make the grass grow but not to kill moss. Is that stupid or utterly daft? It is certainly a convenient fiction that enables sellers to direct you to their expensive moss killer". … My lovely lady in Droitwich used the iron sulphate and was thrilled with the result on her lawn. She put up a notice on the Homebase staff notice board. I understand Droitwich now has some very nice lawns. On re-reading my old post I can see that I have already repeated myself numerous times and even used the same phrases. What else would you expect from a former lecturer? It would seem from the comments I must have lost readers in droves who were horrified that a worm lover should use a worm killer. In point of fact it is only the surface casting worms effected and they are not killed but merely encouraged to go away. I am really quite free of lawn worm casts these days but there is piles of evidence - literally so - that there are myriads of worms active down below. 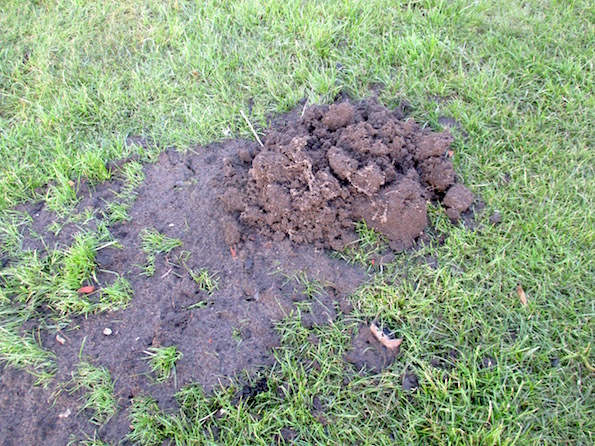 I have been plagued by Moles! 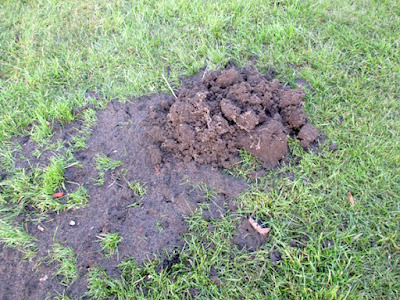 I am constantly treading down raised turf and failing to make the moles go away. Elsewhere in my no dig garden(s) worm casts are a fundamental advantage in mulching the soil surface and making excellent seedbeds. No worm casts but the moles tunnel to find the none casting worms. 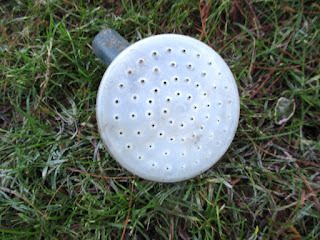 I wonder if any of those readers who were disillusioned with me using iron sulphate use ‘three in one’ lawn treatment? This of course contains iron to act both as a nutrient and for its moss killing properties. I now see some offer a ‘four in one’ with a next to useless trendy extra ingredient. Whatever next? There were a few comments from the USA where it does not seem iron sulphate is much used and gardeners are more concerned that soil acidity might be a problem. This is not my experience but concede not all grasses are acid lovers. One of my earlier activities after retiring was as an editing reader for Gardening Which. 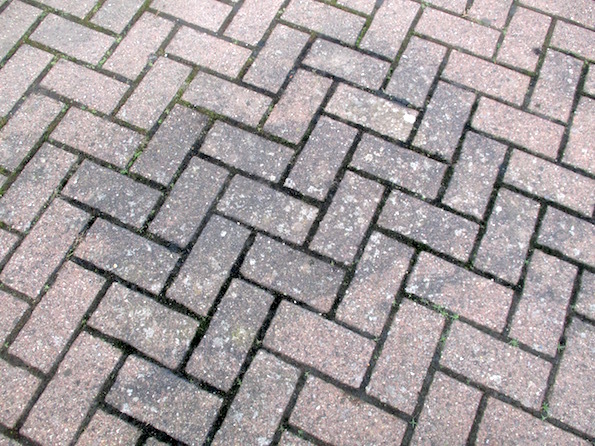 (An early triumph was spotting ‘forget-me-knots’). 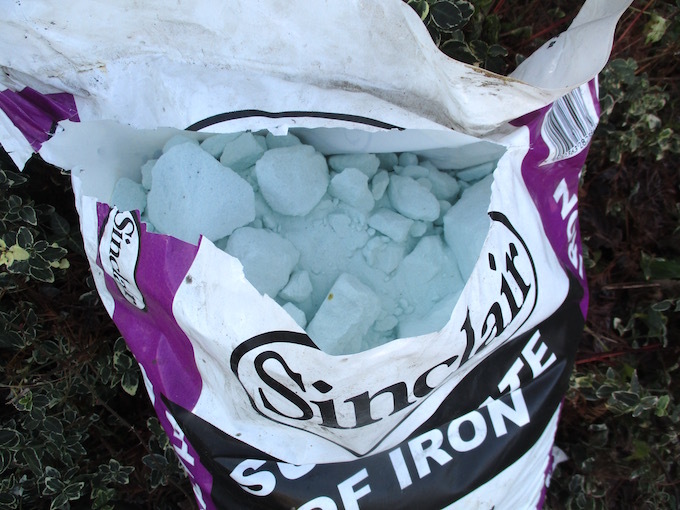 I jumped on the recommendation that iron sulphate was used at up to an ounce per square yard. “Far too much, a clear error, it is used at a quarter of an ounce and will scorch when so strong.” I now know I was wrong! I did mention in my earlier post that I deliberately apply more of my iron sulphate where moss lies thickest and rather less to areas where moss is less apparent. (In summer I apply it more evenly in consideration of its other benefits). As I have become more confident in my flinging technique, really mossy bits probably receive the full ounce! A very thick moss cover needs it! 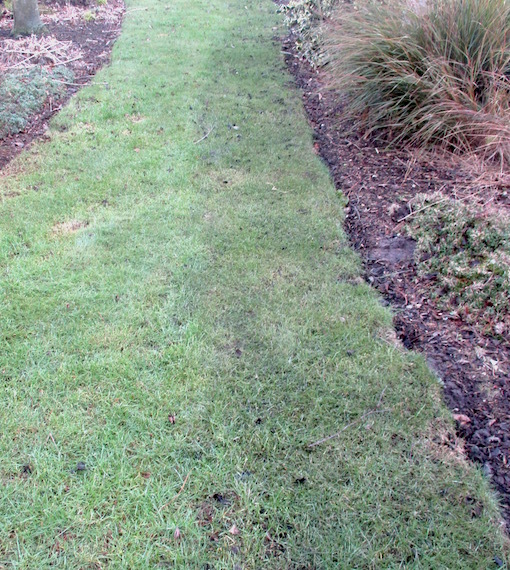 Although I have not applied iron sulphate for three months now in early December my lawn looks moss free. It won’t last. And it didn’t as you can see from the Christmas time pictures below. Although most gardeners with small lawns will prefer to apply iron sulphate from a watering can, I do love my flinging technique. If you have had the misfortune to buy a sack that is lumpy and not powdery and do not have the time or courage to take it back and complain it might be best to dissolve it in water. I curse if I need to break up lumps. 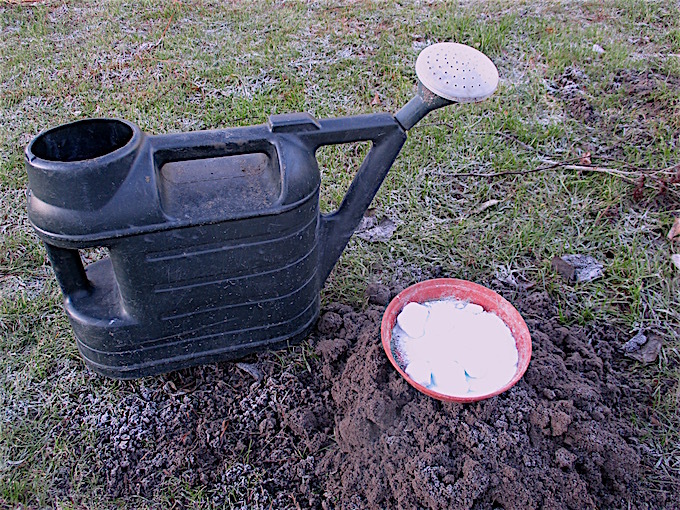 It is sometimes suggested that iron sulphate kills lawn weeds. For this it is utterly useless and the weeds do not turn a hair - other than the obvious - that moss itself is a weed. Nor does iron sulphate harm my border plants when I fling it with abandon. Although I would not dream of drifting it near delicate young vegetables or seedlings or when soft plants are heavy with dew. I have never had any problem with scorching my plants. The worse that will happen is if you use a cheap and nasty fertiliser spreader that spills a great dollop - as they invariably do. It that case the grass will go black but a week or so later you would never know. I stirred the illustrated amount of iron sulphate into my can - and half as much again - to make a near saturated solution. 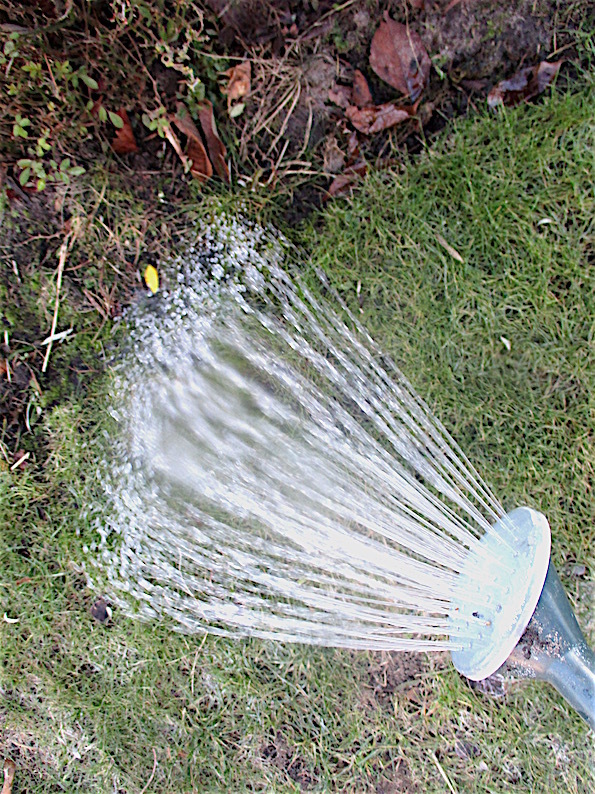 With 600 square metres of lawn it would have taken two or three hours to complete the job with a watering can and I ended my demonstration and finished the job by half an hour of flinging. 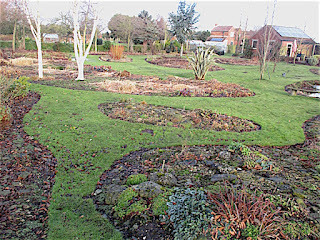 Any going on my borders - safe at this time of year - will nourish the plants and kill moss there too. I give my lawn obsessive attention. One day someone will notice. Thanks, and a happy New Year to you and yours. Many gardeners do accept clover for its nitrogen fixing capabilities. 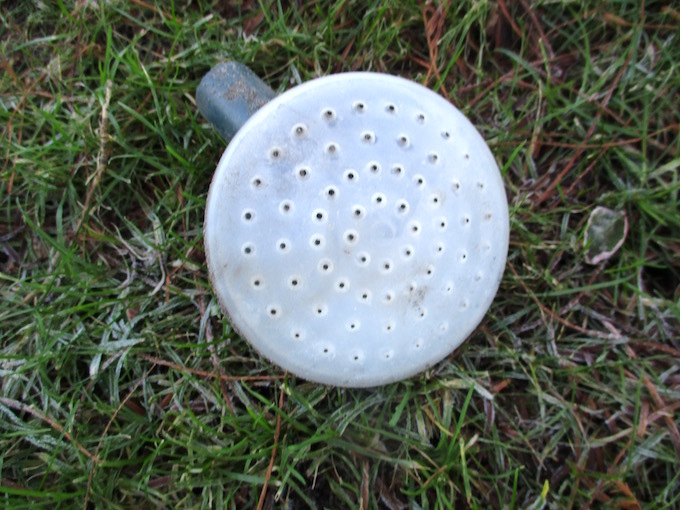 Just as well as many widely available lawn weedkillers do not kill it. I googled looking for products and the first page was full of cultural controls which at best might be described as very labour intensive and at worst useless. In fact there are plenty of lawn weedkillers that kill both red and white clover and the harmless chemical mecoprop comes to mind. Yellow clover is much more difficult and chemicals such as dicamba are available to amateurs. I use professional Grazon 90 but it would be foolish to pay a great deal for treating a small lawn. One of their suggestions is to use a grass fertiliser such as sulphate of ammonia. The clover seems very happy so I am not sure that the grass would give it much competition! Maybe Yara Mila would give it a run for its money. No I don't think so either and general fertiliser (but not sulphate of ammonia) includes phosphate which would encourage it. As someone with neither moss nor lawn (except a little moss on a wall - and I'd like some extra varieties there) . . I find this article quite mesmerising!